f (x) = abx. 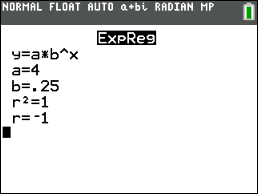 Find the values of a and b, and express an equation that may be represented by this table. This example would be labeled EASY since the y-intercept is given at (0,7) and the ordered pairs increase by the same x increment of 1. 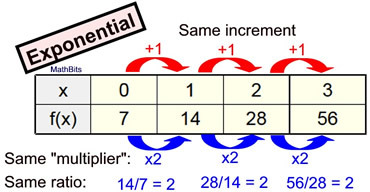 What happens when the x-increment is NOT +1 ? The table at the right shows values from an exponential function. Find the values of a and b, and express an equation that may be represented by this table. 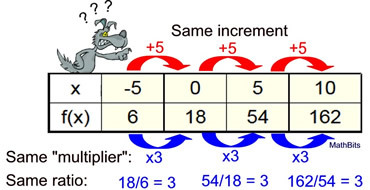 Notice that the "same increment" is now +5 (instead of +1). This will affect the final answer, making this problem's difficulty level HARD. We will proceed with the assumption that our answer will be of the form f (x) = abx. 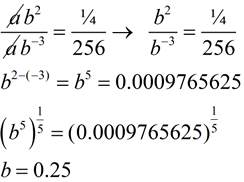 The common factor (or "multiplier") is 3 in this table, so the b value is 3. This is not the correct equation! So, what went wrong? The problem is that our formula, f (x) = abx, assumes that the increment on x will be +1. So, when it sees +5 to the right of 0, it assumes that it is the fifth increment to the right of zero, and not the first increment to the right of zero. The common factor is then applied 5 times, instead of only once, and we get an answer of 4374 instead of 54. How can we "fix" this problem? We need our formula to understand that an increment of +5 is the first location to the right of zero. The formula is making the increment 5 times larger than it needs to be. Since x represents the increments, we need to divide x by 5 to obtain an accurate equation. Is there an easier way to deal with increments not equal to +1 ? With use of the graphing calculator, the difficulty level will be lowered to MODERATE. Solution: We will be using the graphing calculator's ability to prepare an exponential regression equation to find the solution to this problem. Under these conditions, we will be obtaining the actual equation (and not an approximation, or best fit, for the equation). Note r2 = 1 and r = 1 telling us we hit ALL of the points for an actual equation. Use the lists where you stored the points. Fill in Y1 for the graph. But this doesn't match our previous answer, or does it? Put those exponent skills to use! What do we do when no consistent x-increment is given ? Notice: No constant increment on x. No constant multiplier on f (x). We DO KNOW that this is an exponential function since the question says it is an exponential function. We need a new plan of attack on this problem since it is not immediately obvious what the common factor ("multiplier") may be. Choose 2 of the points that are closest to one another, such as x = -1 and x = 1, or x = 4 and x = 6. If the decimal bothers you, choose x = 4 and x = 6. Create a new section of the table filling in the missing increments between the two points you chose. To get a, substitute one of the points, such as (4,24). "Do two points always determine an exponential function?" Assuming that we are speaking about an exponential function of the form f (x) = abx, the answer is "Yes, under certain conditions." 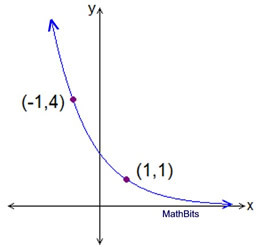 The conditions are that (1) a ≠ 0 (because you would have a straight line), (2) that the x-coordinates not be the same (you wouldn't have a function) and (3) that the y-coordinates of the points be non-zero with the same signs (remember the asymptotic nature of the graphs of these exponential functions - always all above, or all below, the x-axis). So, how do we change two points into an exponential function? Constructing functions given only two input-output pairs (or ordered pairs) can be accomplished in a variety of ways. 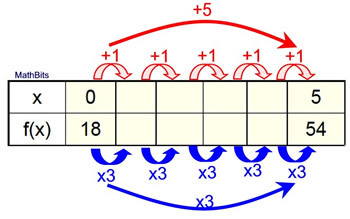 The choice of solution method will depend upon the nature of the given pairs. For example, if you are given the y-intercept as one pair, the solution will be fast and easy. If, on the other hand, you are given two generic pairs, perhaps containing decimals, you will need to do more work to find the solution. Let's take a look at some of the possibilities. Example 1: (easy) Find an exponential function of the form f(x) = abx given the facts that f(0) = 12 and f(5) = 2916. Find a: The y-intercept is 12, so a = 12. Example 2: (moderate) Given the graph shown at the right, find an exponential function to represent this graph. Solution: Points (-1,4) and (1,1). 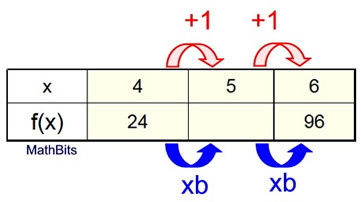 Since neither of these points is the y-intercept, and the y-intercept cannot be read from the graph, a system of equations will be needed to solve this problem. The substitution method shown below is ONE method of solution. Example 3: (harder) Find an exponential function of the form f(x) = abx which will pass through the points (1,30) and (3,187.5). This problem will also require a system of equations. But, this time, we will be using an elimination method to solve, instead of the substitution method shown in Example 2. This will be easier if you start with the larger exponent on top. Example 4: (harder yet) Find an exponential function of the form f(x) = abx which will pass through the points (-3,256) and (2, ¼). Round to nearest hundredths if needed. Again, this solution will use a system of equations with an elimination method. Remember not to round until you reach the final answer. The slightest change in b can affect the answer. If not "asked" to round, leave the full calculator entry. Example 4 AGAIN: (easier) Find an exponential function of the form f(x) = abx which will pass through the points (-3,256) and (2, ¼). Round to nearest hundredths if needed. We will solve this again, using the exponential regression capabilities of the graphing calculator. Be sure your lists match where you stored the points. Fill in Y1 if you want to see the graph.